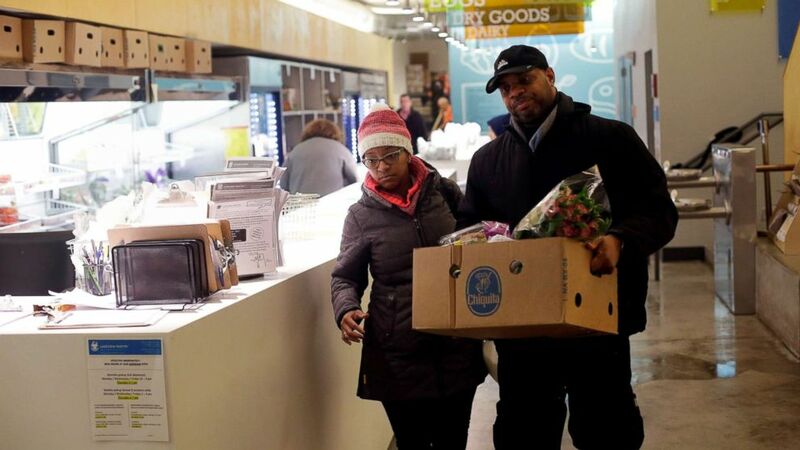 A D.C.-area food bank says 2,200 furloughed employees have picked up food. Over the weekend in Washington, a local food bank said 2,200 furloughed federal employees received produce and other items at pop-up locations. As the historic government shutdown moves into its fourth week, with no end in sight, anti-hunger advocates and other groups are working to make sure that federal employees and contractors can access resources and get food while they aren't getting paid. 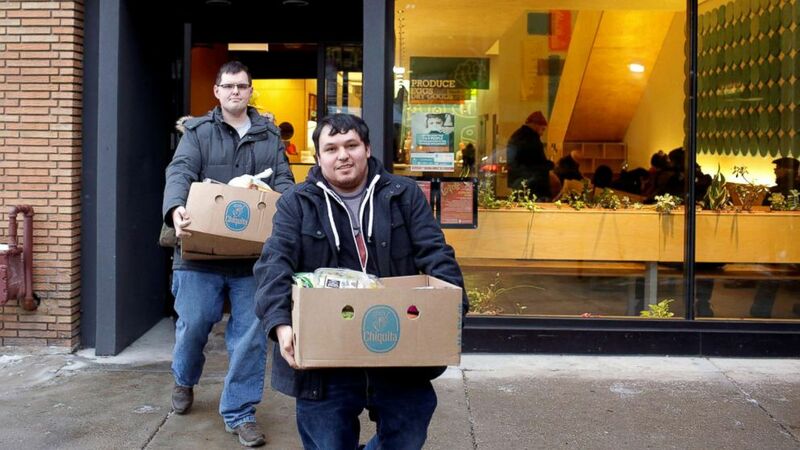 (Joshua Lott/Reuters) TSA worker John Salinas, right, and his fiancee Ryan Farmer leave the Lakeview Pantry after receiving food in Chicago, Jan. 14, 2019. In Dallas a local church is handing out gift cards to furloughed employees. In cities like Tampa, Chicago, Rochester, Minnesota and Ogden, Utah, food banks are setting up pantries or expanding hours so federal employees can pick up groceries or even pet food. Some restaurants have also offered discounts for federal workers. Award-winning chef Jose Andres announced that his organization World Central Kitchen will start serving food on Pennsylvania Avenue in DC. One group, Hunger Free America, launched a hotline and website to help unpaid federal workers navigate the process to apply for benefits, locate food pantries, or find out how to volunteer while they are furloughed. The CEO of Hunger Free NYC Joel Berg worked as a federal employee for eight years at USDA. He said that given low starting salaries for federal employees and that many Americans don't have enough savings for an emergency fund, missing even one paycheck is serious. (Joshua Lott/Reuters) Nate Manning helps his friend and TSA worker Ebony Grays, carry a box of food she received at the Lakeview Pantry in Chicago, Jan. 14, 2019. "It's clear that low-income federal employees could quickly run out of food after being denied even one paycheck. Many dedicated public servants will need extra help with food. This shutdown vividly demonstrates just how many Americans are only one missed paycheck away from hunger." And for people who receive food assistance on a regular basis, advocates want to make sure they know they will receive their Supplemental Nutrition Assistance Program benefits, also known as food stamps, early this month and will have to make them last until the end of February. 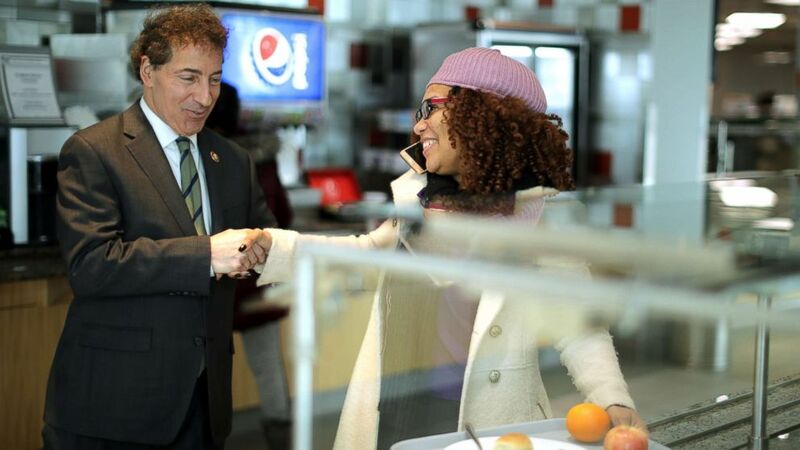 (Chip Somodevilla/Getty Images) Rep. Jamie Raskin greets Consumer Product Safety Commission employee Stacy Summerville as she gathered her lunch in the cafeteria at the Tommy Douglas Conference Center, Jan. 14, 2019, in Silver Spring, Maryland. Angie Rodgers, president of the Arizona Association of Food Banks, told ABC News she knows many families already have to stretch their monthly benefits and are worried about the impact for those that now have to make those benefits last even longer. She said almost all families that receive benefits don't carry any over to the next month and that, when push comes to shove, they'll sacrifice buying healthy food if they have to prioritize other expenses like rent. "I think it really could have a significant impact with low-income families and those struggling with hunger because they are not going to have the cash to be able to float it to the next month," she said in an interview Friday, adding "asking them to stretch a benefit that doesn't usually stretch 30 days into 45 days could be a challenge." Politico also reported that retailers are scrambling to make sure they have enough food in stock to handle an early surge of shoppers using SNAP. The "Fed Food" hotline is available at www.HungerFreeAmerica.org/FedFood and 855-859-4647. Information about SNAP and other government nutrition programs is also available on the USDA website and state government websites. Feeding America also has a search tool to find local food banks at FeedingAmerica.org.